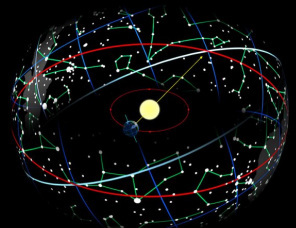 A diagram depicting Earth's position relative to the Sun during the Spring Equinox. Notice that Earth's axis of rotation is pointing 90° (perpendicular) to the direction of the Sun. Notice also the constellations of the zodiac. The seasons are a powerful force in our lives. They affect the activities we do, the foods we crave, the clothes we wear — and quite often, the moods we are in. What is it that causes the change in seasons? The ability to predict the seasons — by tracking the rising and setting points of the sun throughout the year — was key to survival in ancient times. The Babylonians, the Maya and other cultures developed complex systems for monitoring seasonal shifts. But it took centuries more to unravel the science behind the seasons. Nicolai Copernicus (1473-1543) radically changed our understanding of astronomy when he proposed that the sun, not Earth, was the center of the solar system. This led to our modern understanding of the relationship between the sun and Earth. We now know that Earth orbits the sun elliptically and, at the same time, spins on an axis that is tilted relative to its plane of orbit. This means that different hemispheres are exposed to different amounts of sunlight throughout the year. Because the sun is our source of light, energy and heat, the changing intensity and concentration of its rays give rise to the seasons of winter, spring, summer and fall. The seasons are marked by solstices and equinoxes — astronomical terms that relate to Earth’s tilt. The solstices mark the points at which the poles are tilted at their maximum toward or away from the sun. This is when the difference between the daylight hours and the nighttime hours is most acute. The solstices occur each year on June 20 or 21 and Dec. 21 or 22, and represent the official start of the summer and winter seasons. The vernal equinox and autumnal equinox herald the beginning of spring and fall, respectively. At these times of the year, the sun appears to be directly over Earth’s equator, and the lengths of the day and the night are equal over most of the planet. On March 20 or 21 of each year, the Northern Hemisphere reaches the vernal equinox and enjoys the signs of spring. At the same time, the winds turn colder in the Southern Hemisphere as the autumnal equinox sets in. The autumnal equinox occurs on Sept. 22 or 23, when summer fades to autumn in the north, and winter’s chill starts giving way to spring in the south. From year to year, there is always some variability in the equinoxes and solstices because of the way Earth's changing tilt matches up with its orbit around the sun. The precise moment of the equinox is when the sun is exactly overhead, as seen from the point on Earth's equator directly facing the sun at that time, thus the day that comes the closest to offering equal amounts of sunlight and darkness all over the globe — at least until the September equinox. Around the time of the June solstice, the North Pole is tilted toward the sun and the Northern Hemisphere is starting to enjoy summer. The density of the solar radiation is higher because it's coming from directly overhead — in other words, the sun's rays are concentrated over a smaller surface area. The days are longer, too, meaning that more radiation is absorbed in northern climes during the 24-hour cycle. Another factor that may come into play is that the radiation takes a somewhat shorter path through the energy-absorbing atmosphere before striking the earth. At the same time that the Northern Hemisphere is entering summer, the South Pole is tilted away from the sun, and the Southern Hemisphere is starting to feel the cold of winter. The sun’s glancing rays are spread over a greater surface area and must travel through more of the atmosphere before reaching the earth. There are also fewer hours of daylight in a 24-hour period. The situations are reversed in December, when it’s the Southern Hemisphere that basks in the most direct rays of the sun, while the Northern Hemisphere receives less dense solar radiation for shorter periods of time. Although the solstices represent the pinnacles of summer and winter with respect to the intensity of the sun’s rays, they do not represent the warmest or coldest days. This is because temperature depends not only on the amount of heat the atmosphere receives from the sun, but also on the amount of heat it loses due to the absorption of this heat by the ground and ocean. It is not until the ground and oceans absorb enough heat to reach equilibrium with the temperature of the atmosphere that we feel the coldest days of winter or hottest days of summer.